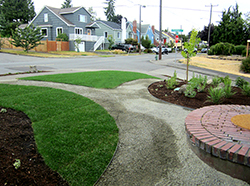 Katie Weber is the designer and owner of Katie Weber Landscape Design, a design firm doing business in the Seattle area since 2004. Katie joined APLD in November of 2003, while still a student. She served on the APLDWA board from 2006-2008 as Member Liaison. After taking leave to raise her two boys, she rejoined the board in January of 2014 and now serves as Secretary. 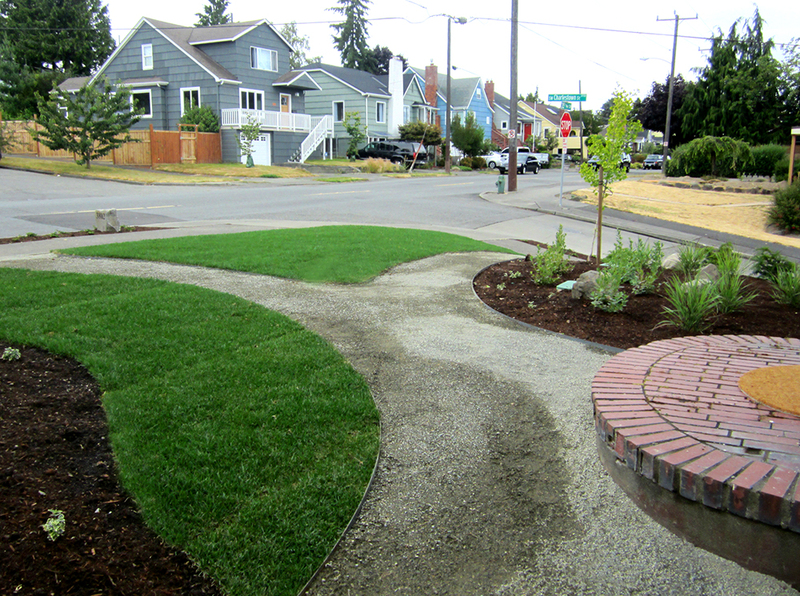 The fountain is the focal point for this small West Seattle front garden. Born in Southern California and raised in the farming community of Canby, Oregon, in the Willamette Valley, Katie is a west coast girl through and through. She attended University of Puget Sound and graduated with a Bachelor of Science degree in Biology. 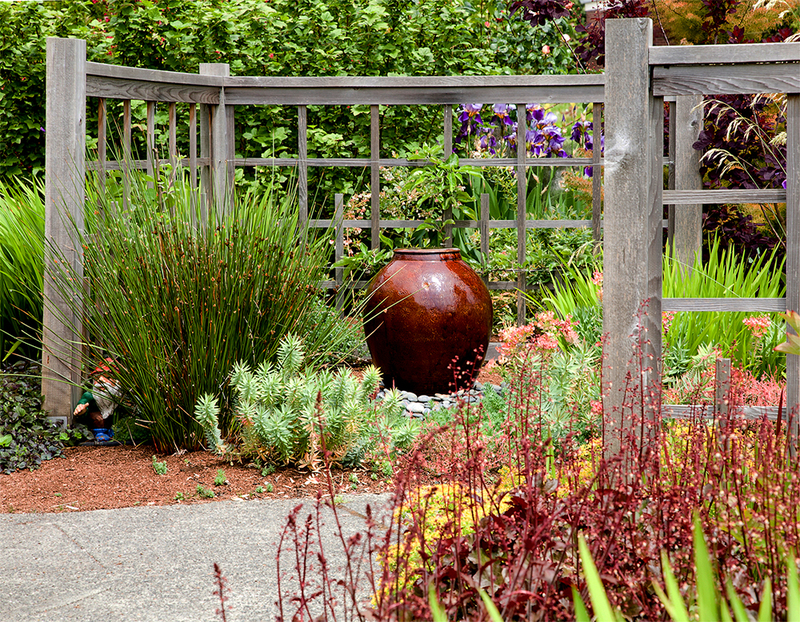 After working many years in research at Oregon Health Sciences University, University of Oregon, and Fred Hutchinson Cancer Research Center, she decided to shift gears and pursue her interest for gardening and design. 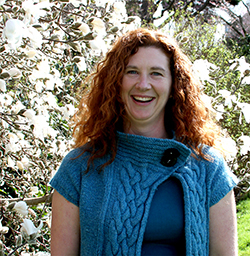 She enrolled in the Landscape Horticulture program at South Seattle Community College in the summer of 2002 and knew immediately that she had found her passion. 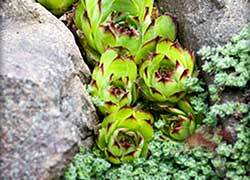 Katie Weber Landscape Design is a design-only company. Her focus with every design is to create site-appropriate landscapes with year-round interest, customized to her client’s needs and wants. 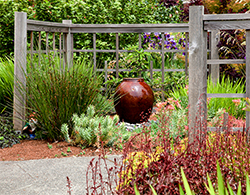 She loves bringing life and beauty to the often small, urban spaces her clients are challenged with. Her membership in APLD is her connection to peers, colleagues, and the contractors that install many of her designs. 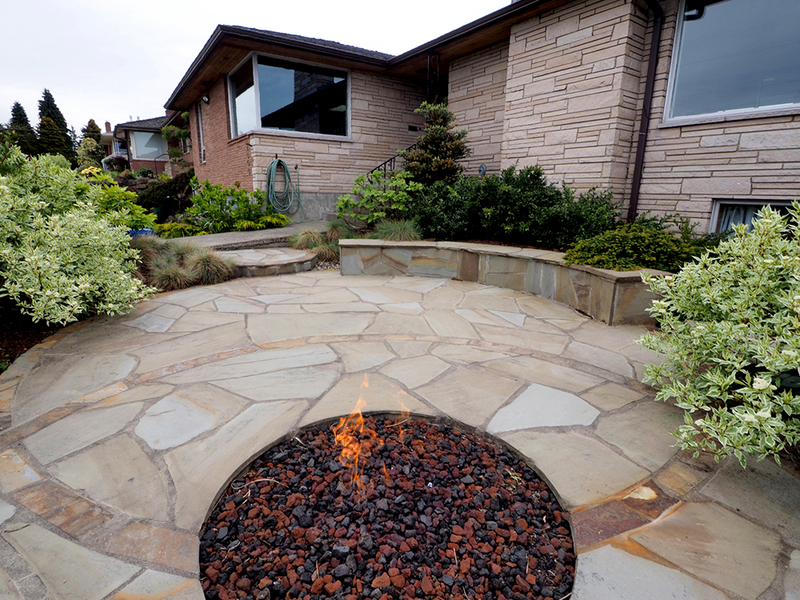 The stone patio is made of three overlapping circles. The built in seating faces the view and doubles as a retaining wall. 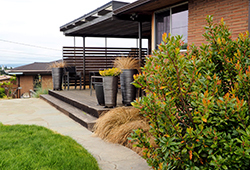 The side garden, too narrow for fencing (that would obstruct views as well), is fun with a zig-zag to the paving and low, soft grasses and perennials. The patio and plants in back compliment the deck and dining area. 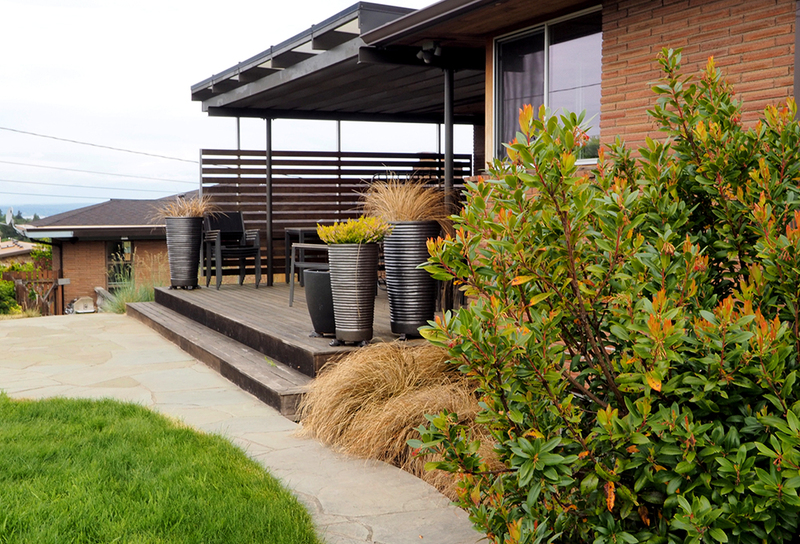 The mid-century home in North Seattle has beautiful views of Puget Sound and the Olympics, but only in the front yard. The existing garden on the property was an outdated and overgrown collection of plants and lawn. My program for the front of house was to provide a venue for enjoying the view, including privacy from the street, while creating a plant palette with year-round interest and minimal maintenance. Removing the lawn in front was all required. In addition, I was asked to bring the design around the small side garden and into the back, where a new deck and home update had recently been completed. The rest of the back of house was to remain mostly lawn and a play structure for the family’s young children. During the design process, I reviewed the neighborhood’s covenants, conditions, and restrictions. For this particular neighborhood, the CC&Rs mostly include restrictions on the height of trees to maintain the views to the Sound. My design plan had to be reviewed by the governing board to make sure I did not include any trees that would grow over the height of the home’s roofline. Fortunately, no changes needed to be made. The resulting design is one that invites the family and guests outside. 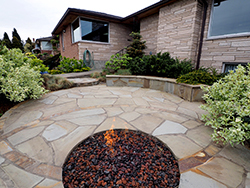 A patio of overlapping circles, with built-in seating (that doubles as a retaining wall) and a gas fire provide the focus. The plantings, including variegated red-twig dogwood, oak-leaf hydrangea, yews and strawberry trees, serve to provide privacy from the sidewalk and street while softening the patio edges; all without restricting the spectacular territorial view. Imagine watching the sun set as you sip wine around the fire! The same stone used in the patio field continues down the narrow side garden, where small plantings of conifers and grasses provide the border between neighbors. In the back, the stone again becomes a patio, this time as a landing off the deck and into the lawn where the kids can play. 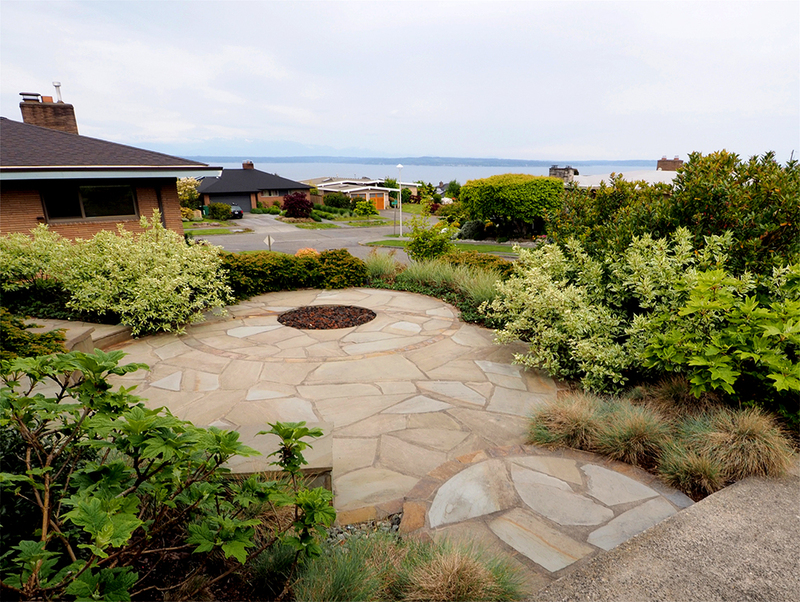 From the patio, the pathway leads to another circle, this one ringed in river rock. It defines the space used for the family’s abundant yearly vegetable garden. Plantings in back are drought resistant and low maintenance and include another strawberry tree, bronze sedges, and lavenders. Thanks to Nyce Gardens for the installation! A Korean Fir anchors one of the garden’s corners. 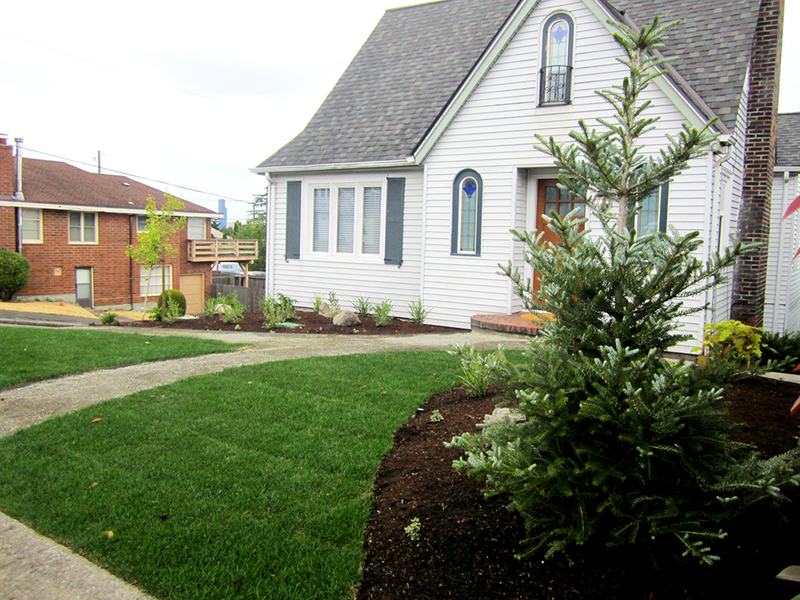 The view from the front stoop, part one: grasses, blueberries, yews, and Gingko. The view from the front stoop, part two: the pathway to the main street. A Gingko will provide screening to oncoming headlights while a new path provides access to the corner lot’s sidewalk. This West Seattle home’s garden was out-of-date, overgrown, and hazardous (in more ways than one). Its location on the corner of a busy street meant that the tall, rotten fencing and overgrown roses that lined the front made it difficult for any driver to see around the corner. The lawn was uneven and weedy. Visitors could rarely find the home on the first drive by because there was no way to see house numbers or even the front door. The parking strips were paved in mossy, slippery brick that were impossible to weed and treacherous to walk on, especially on the steeply hilled side yard. Along the side yard’s sidewalk, an overgrown holly engulfed the steep walkway and restricted any passage up or down the hill. And overall the style of the space did not fit my client’s aesthetic and far exceeded the maintenance they were interested in providing. My program was to remove the hazards (brick paving, holly, roses, and uneven steps), existing plantings and the fencing (which was falling down regardless); provide improved visualization and street appeal of the home from the street, create a beautiful, low maintenance planting scheme (including blueberries), and design a walk to the front door accessible from either side of the corner. The beautiful result is a garden that is lush with plants, all set back from the sidewalk; adjacent is a new lawn providing an unobstructed view around the corner. The new walk to the front door is packed gravel with aluminum edging. 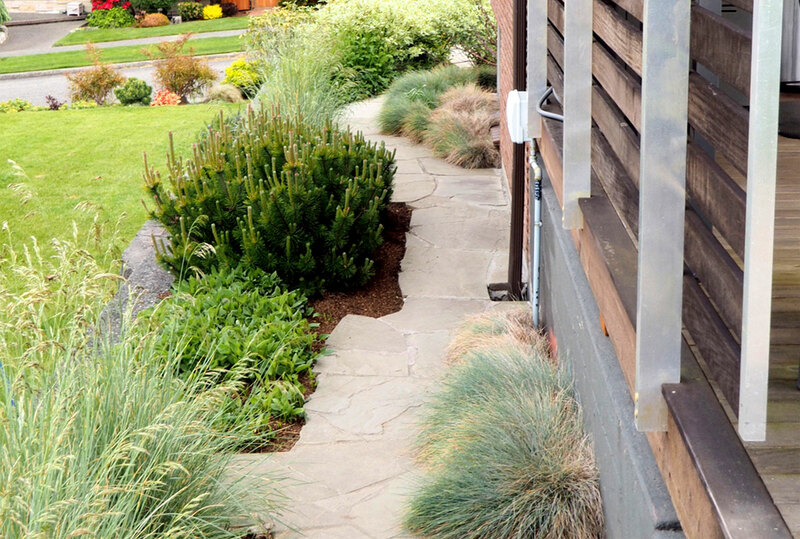 A stone step accommodates the steep hill on the side yard path. House numbers engraved on a boulder placed in the parking strip improve the home’s visibility, while the Rubus pentalobus replaces the slippery, weedy bricks in all of the planting strips. As it grows in, the ground cover will become a nearly indestructible weed barrier. The plantings include Sunshine Blue blueberries, gingko, grasses, a Korean fir, hydrangeas and yews. The gingko is not only the centerpiece of the main planting bed, it will also screen headlights from shining into the guest bedroom at night. 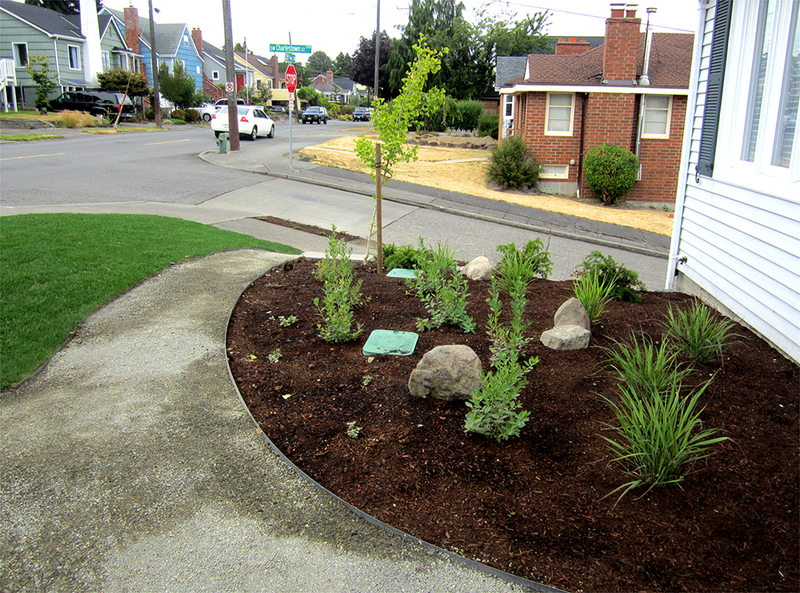 Thank you to Elliott Bay Landscapes for the installation! 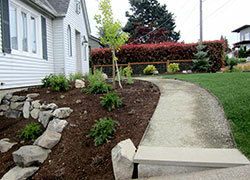 Katie Weber Landscape Design offers design services and project management on construction in the Seattle area. 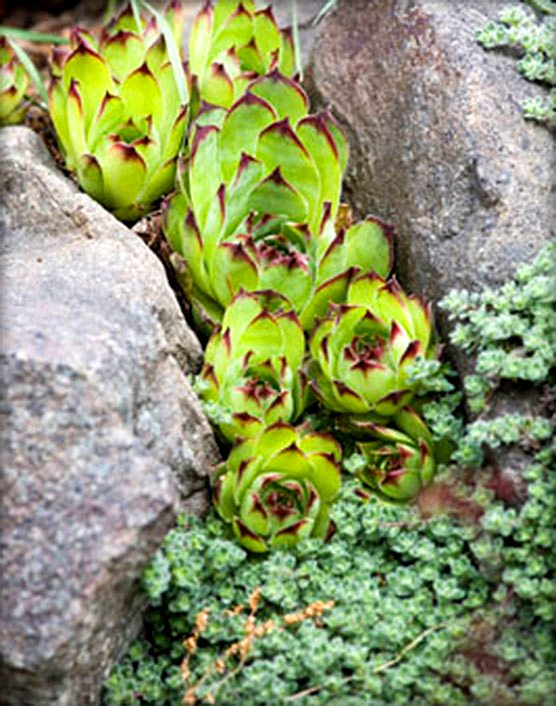 Learn more at: www.katieweberlandscapedesign.com.